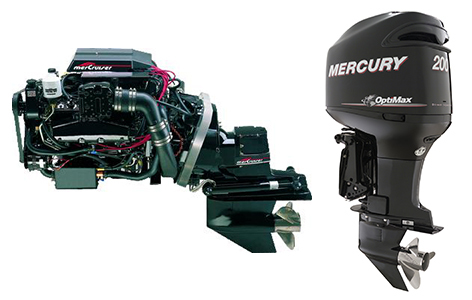 Harbin Marine is a full service boat engine repair facility which specializes in repair for Mercury outboards and Mercruiser engines and sterndrives. All of our technicians are Mercury and Mercruiser Certified. We use nothing but original equipment parts and accessories on each unit we service. We have nothing but the best in diagnostic equipment to keep your boat running longer and stronger for a trouble free season. All of our customers can be rest assured they are getting the very best each and every time because it is our standard practice to annually send all technicians to Mercury/Mercruiser training facilities, where they stay current with different marine industry updates. Whether it’s the awards hanging on the wall or the knowledge of each individual, there is no wonder why Harbin Marine has the absolute best service available in the Northern Virginia area. We are proud to offer a service department that has earned a reputation for excellence and customer satisfaction. Whether your boat needs a complete new power package, new engine, or just some annual maintenance or winterization, we would be more than happy to serve you. Harbin Marine also handles all types of insurance claims for those unforeseen mishaps. We deal directly with all of the different insurance companies on a daily basis. You can be assured that you will be back on the water as quickly as possible. Call 703-550-7272 and ask for Service to schedule an appointment.